Data management for random drug & alcohol testing can prove challenging: Personnel rosters are often not current at the time of a random selection. 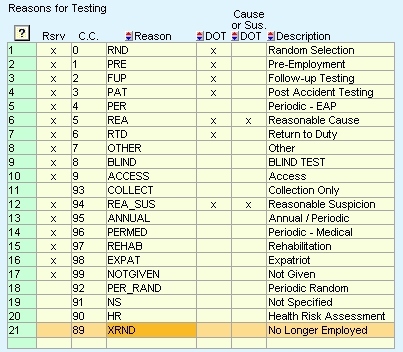 In the software, random drug and alcohol tests persist as "pendings" until collection information is resolved. If a someone is not tested and no longer an employee, you'll need to change the reason for testing and enter a note to substantiate the non-testing. First, enter a new reason for testing into your database. Note: Changing the reason for testing prevents the record from reporting as a Random Test. On the Summary Page, click the dropdown arrow for Reason for Testing and select the new reason entered in Figure 1-1. Click the Collection Tab and enter a note to substantiate the absence or reason for non-testing. Click the Save button (see bottom left edge).